Lady Gaga didn’t throw just any ordinary party for the launch of her first fragrance, she hosted a masquerade black-tie event complete with a live tattoo session housed inside a giant replica bottle of her FAME perfume. 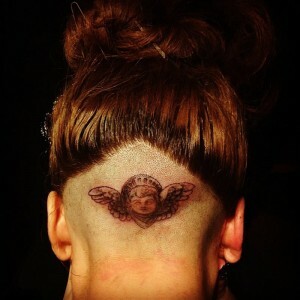 If you thought Lady Gaga shaving her head was extreme, check out the pictures of the singer going under the needle and getting her newest tat: a cherub angel inked on the back of her neck! Lady Gaga took performance art to a whole new level at the launch of her FAME fragrance on Thursday. Not only did she appear inside a large replica bottle of her new perfume, but attendees of the masquerade black-tie event got to watch as the pop star got a brand-spanking new tattoo inked on the back of her head/neck! Lady Gaga shaved a portion of her head earlier this week to mourn the passing of Terry Richardson’s mother, and we had a sneaking suspicion that a new tattoo would find its way onto that triangular spot at the nape of her neck. The pop star’s new neck tattoo features a smallish cherub angel inked in black and white with wings and a Statute of Libery-esque crown atop its head. The launch party – and Lady Gaga’s inking – took place at the Solomon R. Guggenheim Museum on New York’s Upper East Side. Inside the FAME fragrance bottle, Gaga sported a sparkly top, a red wig and a black skirt, but eventually stripped down to lingerie and a thong, removing her wig as well. Throughout the performance aspect of the perfume launch, Lady Gaga remained inside the bottle, applying makeup and playing on an iPad while carefully chosen songs by David Bowie and Edith Piaf played in the background. During a performance of Kanye West’s latest song “Mercy” though, is where it got interesting. Lady Gaga laid down and received a tattoo on the back of her neck while curious eye-mask-wearing onlookers watched through the transparent glass. Not just any ordinary onlookers though; we’re talking celebrity attendees like Yoko Ono, Paris Hilton, Lindsay Lohan, Michael Strahan, Jason Wu and Marc Jacobs. Cherub Neck Tat Represents a Guardian Angel? 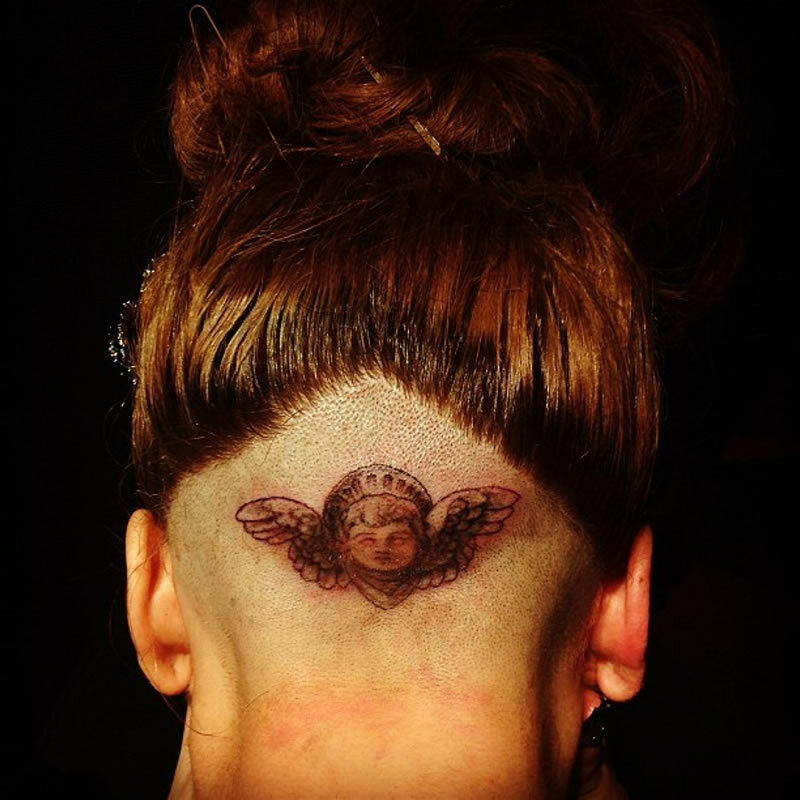 Since Lady Gaga got the cherub angel tattoo in the same spot that she shaved in honor of Terry Richardson’s mother, it’s likely that the new ink represents a guardian angel. Accompanying the pictures of Lady Gaga’s shave job that she posted on Twitter on September 11, the singer wrote, “I did it for u Terry. I’m sorry about ure mommy. She has princess die, but were all princess high.” Terry Richardson is an American fashion photographer and his mother, Annie Lomax, passed away on Tuesday in an intensive care unit. Terry and Gaga developed a friendship and professional relationship back in 2010, and the photographer began cataloging photograph’s from the singer’s life, which were eventually released in a book collaboration called Lady Gaga X Terry Richardson. Lady Gaga’s shaved scalp matches Richardson’s own bald spot on the back of his head, and was meant as a show of solidarity with her famous friend. Lady Gaga called the performance piece “Sleeping with Gaga,” and the event – including the tattoo session – was streamed live on littlemonsters.com for all Gaga fans to witness online. Lady Gaga’s angel tattoo on her neck comes almost exactly two weeks after she debuted her anchor side tattoo, inked in honor of boyfriend Taylor Kinney, along with the message, “New Tat. Stamp of His Mermaid.” In keeping with her promise to her father to keep one side of her body “normal,” the anchor tat was inked on the left side of her body, along with all Lady Gaga’s tattoos. Although the singer’s new neck tattoo isn’t technically inked on the left side of her body – similar to the flower tat on her lower back – we’re guessing Daddy Gaga will make an exception for this inspiring tribute tat.